Africa Zone Five Table Tennis president Andrew Mudibo has been elected the chairman of the sport’s local governing body.Mudibo was elected as the Kenya Table Tennis Association (KTTA) during the national elections held at Kenya National Sports Council (KNSC) boardroom at the Nyayo National Stadium yesterday. 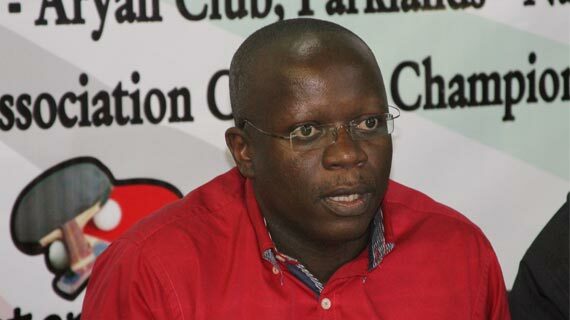 Mudibo, who was elevated from the position of secretary general that he had been serving to the chairmanship by outpolling Francis Gishomo 10- 4 in the polls presided over by KNSC and National Olympic Committee of Kenya (NOCK). He assumes the helm of KTTA for a four-year term. “Today is not a day of talking we have another four years. For those who want to work join us, structures will be put to identify technical officials. Acknowledged the support we've gotten from Nock and KNSC,” he said. Five provinces –Nairobi, Central, Coast, Rift Valley and Nyanza took part in the election, where Francis Ekumbo and James Chacha represented NOCK while Nderitu Gikaria represented KNSC. In his acceptance speech, Mudibo said he would spearhead the working out of a new constitution that’s in line with Sports Act within his 100 days in office. “I am committed to ensure the development of the sport in the eight branches that spreads across the 47 counties. All structures will be worked out towards the annual subscription fee of branches,” he said after the victory. Mudibo, however, refuted claims that the elections were pre-meditated and only used to rubberstamp the victors. “Election is about strategy and having team players. I believe we worked in accordance with the law,” he said.